The Transit Return on Investment (ROI) Study is an analysis of the potential economic impact of investments to build a complete transit system in the Omaha metro area (Douglas, Sarpy, urban Pottawattamie Counties). These potential investments are based on the vision laid out in Heartland 2050, Close the Gap and other planning initiatives. 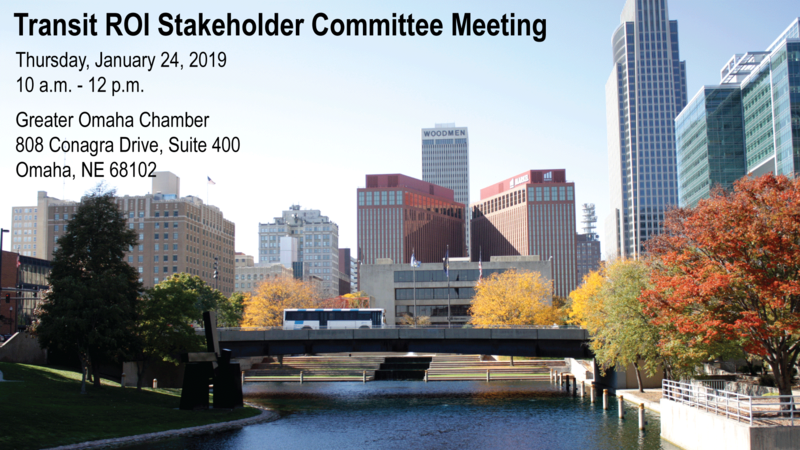 The Transit ROI Study Stakeholder Committee meeting will consist of 19 members, chosen strategically, that include public, private and non-private sectors representing all areas of the Metropolitan Planning Organization (MPO). 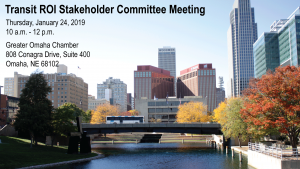 The meeting takes place Thursday, Jan. 24 from 10 a.m. to 12 p.m. in Suite 400 at the Greater Omaha Chamber. Free parking is available directly across the street (Conagra Drive) from the building. The gate will be open prior to the meeting for attendees to park.